UniLodge at VU offers 2 types of 2 Bedroom apartments to choose from. Select a room type below or scroll down for more details. 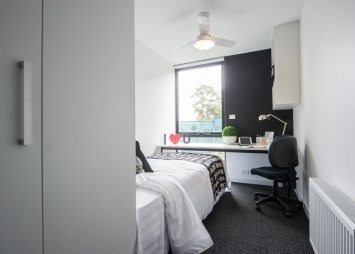 The shared apartment space includes a bright modern kitchenette with cook top, range hood, convection microwave, a full size fridge freezer, dining table with chairs, a compact modern bathroom with toilet, shower, wash basin, vanity with mirror and shelving. NB. there are also 2 x fully equipped communal kitchens on the ground floor for this big group cook-offs (other communal areas in the building include the study rooms on the residential floors, the games rooms, cinema theatrette, a café, outdoor courtyard with BBQs and half-court basketball, spacious and secure Laundromat, plus a rooftop garden deck with city views!). Your bedroom (within a 2 bedroom Apartment) has its own security swipe access for your privacy. It includes hydronic heating for the cool Melbourne winters, and a ceiling fan to circulate the tempered air in the warmer months, a comfortable King Single bed, 3 leaf wardrobe, reading lamps and shelves at your bedhead and the study desk, a study chair, a bedroom TV, large pin-board, data port, lots of power points, and is fitted with modern blinds. ***Short term leases are subject to availability. Please contact us by email or call +61 3 9998 8490 for availability prior to making a booking. $5.00 per/week to the above rate for any room on High Floor (Levels 10, 11, 12). Your fully furnished apartment designed for mobility and impaired person, it includes a dining table, modern kitchenette with fridge, cook top, range hood exhaust, convection microwave. 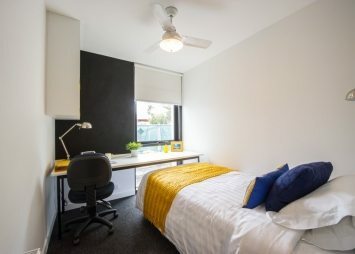 Your private bedroom (within 2 bedroom apartment) is designed for mobility and impaired person includes hydronic heating for the cooler Melbourne winters, and a fan to circulate the tempered air in the warmer months, a comfortable queen bed, wardrobe, shelves, study desk, study chair, lamp and pin-board, with data port, and fitted with modern blinds. Don’t forget you have an electronic key right to your bedroom door.